During the past twenty-five years, the Best American Poetry series has become an annual rite of autumn, eagerly awaited and hotly debated: “an essential purchase” (The Washington Post). 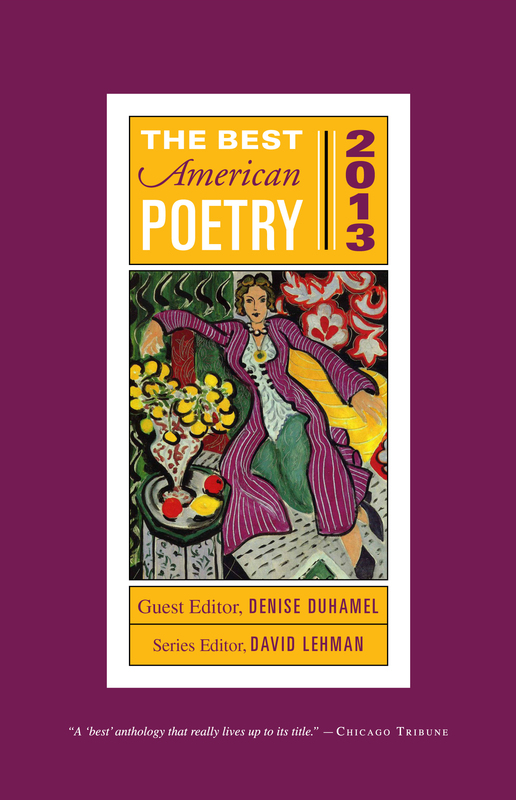 This year, guest editor Denise Duhamel brings her wit and enthusiasm and her commitment to poetry in all its wide variety to bear on her choices for the 2013 edition of The Best American Poetry. Like her own vivacious, moving, and sometimes hilarious poems, bursting with energy and displaying an extraordinary dexterity, the acts of imagination included here testify to the vitality of the art in the United States today. Readers of The Best American Poetry 2013 will encounter such known stars as Kim Addonizio, Tony Hoagland, James Tate, and Mary Ruefle side by side with the rising voices of Nin Andrews, Bruce Bond, Anna Maria Hong, Timothy Donnelly, and Jericho Brown. This edition opens with David Lehman’s incisive “state of the art” essay and Denise Duhamel’s engagingly candid discussion of the seventy-five poems that made her final cut.